Good afternoon. There's 22 days until Christmas. With nothing that we know of in writing, the U.S. has allowed the Chinese to further delay harsher new tariffs for a big chunk of President Trump's remaining first term. 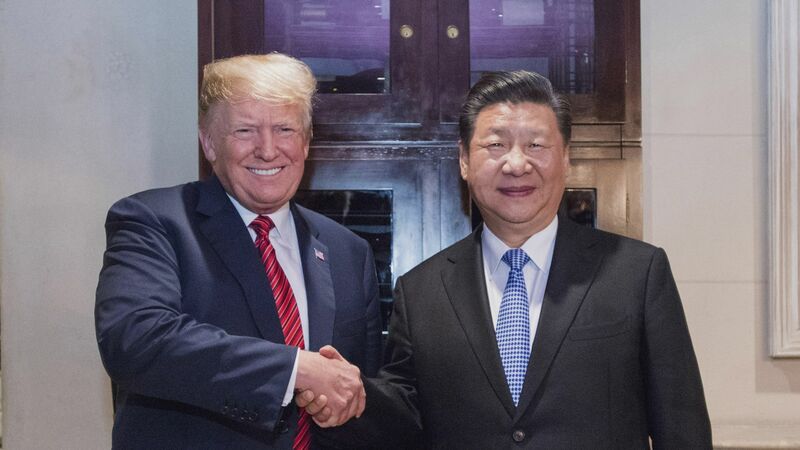 Trump tweeted this morning: "President Xi and I have a very strong and personal relationship. He and I are the only two people that can bring about massive and very positive change, on trade and far beyond, between our two great Nations." Driving the news: Based on Larry Kudlow's comments to media today, the 90 day "ceasefire" that Trump announced this weekend will run until April 1, rather than March 1. Why it matters: "Trump and Kudlow seem to think that pre-announcing a 0% tariff on Twitter and in the press is a constructive negotiating tactic," Axios' Felix Salmon emails. "Few trade negotiators would agree with them." Auto tariffs: It's still unclear whether the White House has secured Chinese agreement on slashing — or eliminating — the tariff on imported autos. "If China does reduce or remove auto tariffs ... we would expect Tesla, Daimler and BMW to see the largest benefits, vs. the Detroit 3," Barclays automotive analyst Brian Johnson noted in an email to investors. Agriculture: “Farmers will be a very BIG and FAST beneficiary of our deal with China,” Trump tweeted. But it's unclear which products they'll be buying. U.S. soybeans in particular have taken a heavy hit. Intellectual property theft: Kudlow noted that the hawkish Robert Lighthizer will be directing this front of negotiations. The bottom line: The market isn't treating this as a breakthrough. The Dow is up roughly 300 points since the weekend, rather than the major upswing you'd expect with a deal. "What we are seeing right now is a cautious hopefulness that maybe we might be on the road to some kind of a deal, at some point in the future, and that road does not include a fully fledged trade war," Felix Salmon told Axios' Dan Primack on the Pro Rata podcast. "This is more of a 1.5% rise on hopes of something good happening in the future, rather than going crazy because they've got what they want." 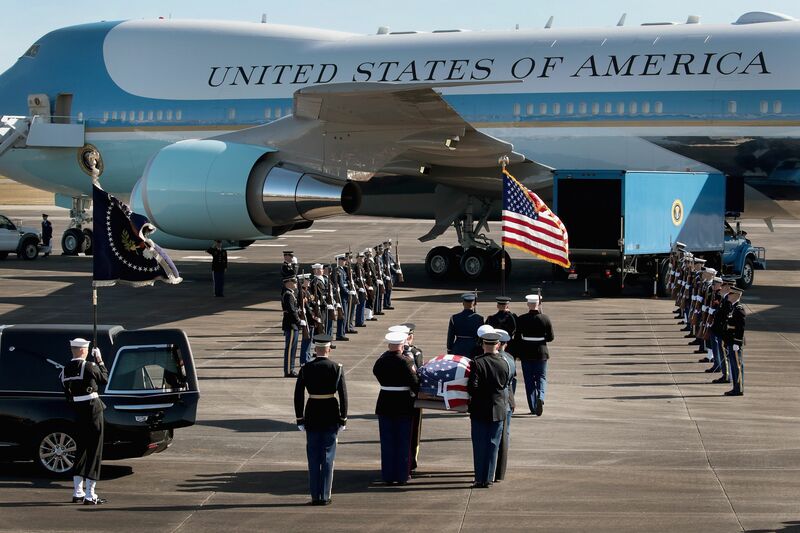 Above: The body of President George H.W. Bush is carried to Special Air Mission 41 by a military honor guard before flying to D.C. from Houston. 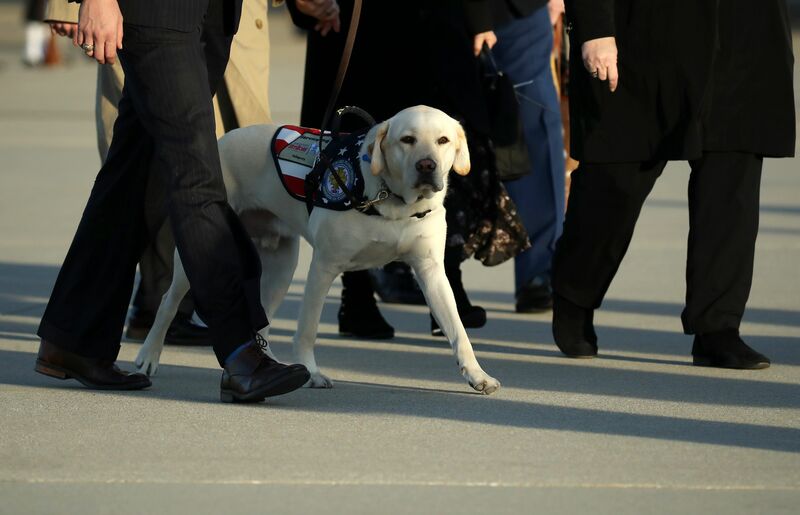 Below: Sully, Bush's yellow Labrador retriever service dog, walks through Joint Base Andrews en route to D.C.
Trump's Mueller tweets: He praised Roger Stone for refusing to cooperate, while bashing former loyalist Michael Cohen and demanding he serve a full sentence. Qatar is leaving OPEC: The tiny nation is the third largest natural gas producer on Earth. Go deeper. SpaceX set records by launching 64 satellites from 34 organizations into space, while successfully reusing a Falcon 9 rocket booster for the third time. Go deeper. Carl Icahn bashes industrial conglomerates: "They are not able to get the returns you'd like to see. They overpaid for a lot of the assets they bought. And the management was really never that good to begin with." Go deeper. New "Axios on HBO" clip: Amy Harder interviews Sen. Sheldon Whitehouse on nuclear power. Watch it here. "Can You Like the Person You Love to Hate?" [N.Y. Times writer and opinion editor] Bari Weiss and [Vice politics writer] Eve Peyser were Twitter enemies. Then they met." "But [Weiss] wondered: If we had met at a dinner party rather than on Twitter, would we have liked each other? Was social media... creating a sense of intense conflict where there might be intense conversation? Did we actually dislike each other, or was Twitter just making us think we did?" "This is the story of how we went from being enemies to friends."